How do I register to view my statements online? 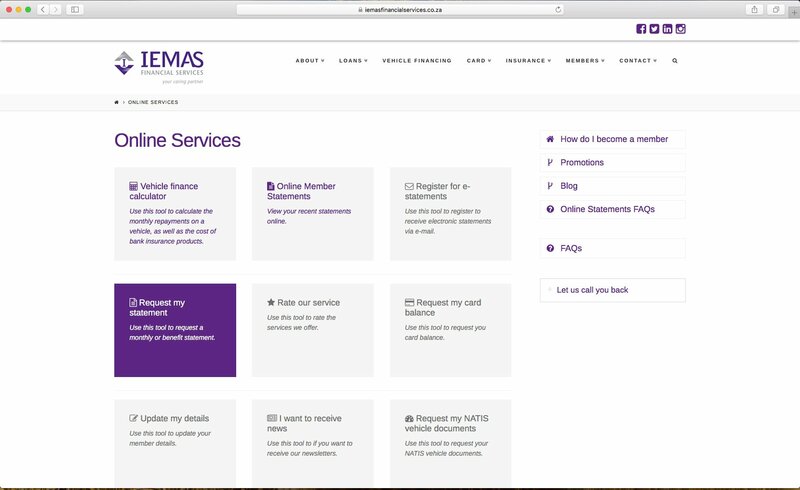 Contact your nearest Iemas branch or 0861 043 627 to request for your statement indicator to be changed to receive your monthly statement via the online platform. A first time user must use his/her 7 digit Iemas member number for both the Username and Password fields. I cannot access my online statement? Contact 0861 043 627 to confirm whether you have opted to receive your statement via the online statement portal? If you have opted to receive your statement via the online statement portal, please be advised that you statement will ONLY BE AVAILABLE after the next statement run which will occur on the 8th DAY OF THE FOLLOWING MONTH. You will be notified via SMS when your new online statement is available. I do not know / remember my password? Contact 0861 043 627 for password reset assistance. How do I change the way I receive my statement? Contact 0861 043 627 for assistance. I have not received my statement and cannot log in via the online platform, what must I do now? How do I log in if the online portal does not recognise my e-mail address? A first time user must use his/her 7 digit Iemas member number for both Username and Password fields. Alternatively contact 0861 043 627 to confirm whether you have opted to receive your statement via the online statement portal?